The FLASH II project – the extension of the free-electron laser FLASH – has reached an important milestone: On 20 August 2014, at 20:37 h, the accelerator team of the late shift was able to detect the first laser light at the new undulator line named FLASH2. Simultaneously, FLASH´s first undulator line FLASH1, which is provided with electron bunches from the same accelerator, could continue to operate without restrictions. The undulators are periodic structures of magnets with alternating North-South polarity in which the X-ray laser light is generated. “This makes FLASH the world’s first free-electron laser that serves two laser lines simultaneously and independently from each other,” says project leader Bart Faatz. FLASH2 – the new undulator line of FLASH. 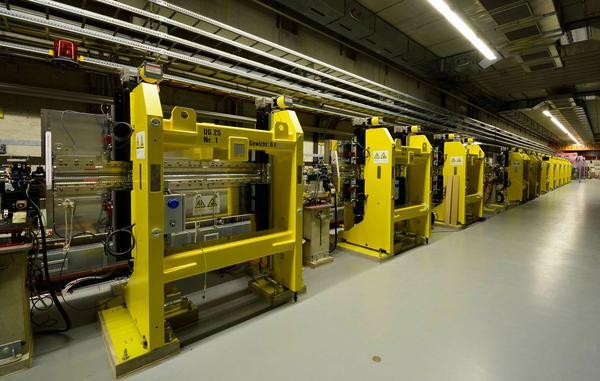 When the DESY free-electron laser FLASH started operation in 2005 being the world’s first user facility, this was also the start of the X-ray laser research era. A superconducting linear accelerator accelerates densely packed electron bunches which – travelling at almost the speed of light through these undulator magnet structures – generate ultra-short and highly intensive laser light pulses in the X-ray range. From the beginning, FLASH was a research light source that was very much in demand and therefore frequently overbooked. With the purpose to meet the rapidly growing user requests for experiments with X-ray laser light, the project FLASH II was started in autumn 2011, an extension of the free-electron laser: For 30 million euros, FLASH was to be upgraded by a second undulator line and a second experimental hall, thus allowing to conduct twice as much experiments than before. An important basis for this purpose is the superconducting TESLA accelerator technology with the possibility to supply several undulators with one linear accelerator. The FLASH2 undulators consist of two halves of periodic arrays of magnets which can be moved together and apart. This changes the wavelength of the emitted laser light while the wavelength of FLASH1 can be adjusted by the energy of the accelerated electrons. Now, the scientists commissioned the new sector of the free-electron laser for the first time, generating laser light at a wavelength of about 40 nanometres. At the same time, FLASH1 delivered laser light flashes at 13.5 nanometres. In a following test shift, the scientists varied the wavelength of the laser beam down to 22 nanometres with FLASH1 generating constant wavelength. During normal operation, FLASH2 is to produce wavelengths between 4 and 60 nanometres. “The successful demonstration of the simultaneous operation of two independent X-ray lasers, FLASH will open up a bunch of fascinating new research opportunities in the near future,” says Wilfried Wurth, scientific head of FLASH. 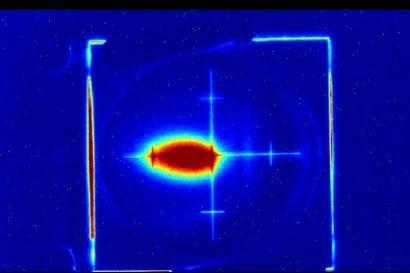 Intense spot on a screen: one of the first laser pulses out of FLASH2.